Pumpkin spice lattes are a staple at Starbucks in the fall, but they’re so popular that almost everyone is trying to put one out there to grab the attention of pumpkin spice fans. McDonalds has just introduced a Pumpkin Spice Latte to their menu, a drink that will be offered for a limited time during the fall. 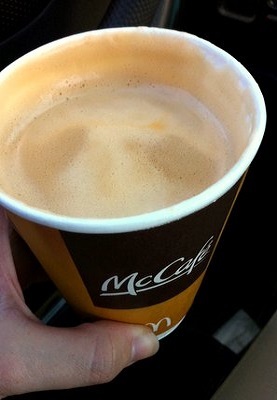 I admit that I was curious and made a mental note to pick one up the next time I was driving by a McDonald’s and felt like having a cup of coffee. When I finally got around to trying one a few days ago, I found that the drink captured the idea of pumpkin spice very well, and that it had a nice spiciness where I could easily taste cinnamon and cloves. I expected it to be very sweet, but the pumpkin spice syrup didn’t cover up the flavor of the coffee. Surprisingly, I actually thought it was less sweet than the Starbucks version – although it is also slightly less spicy than the Starbucks PSL and definitely isn’t quite as rich seeming, either. Overall, I liked it and would definitely drive through to get one again. It is less filling than the Starbucks version (probably because it has slightly fewer calories and less fat) and will definitely hit the spot when I want to warm up with a little spice on a cool fall day.